I finally had a free day with no major commitments and was able to finally get some work done on my projects – it’s been a productive day. 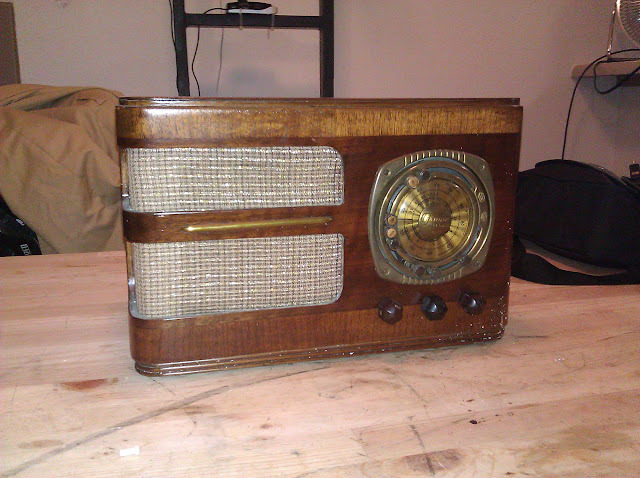 I picked up this nice example of a Grunow 588 “Teledial” radio from the General Household Utilities Co. a few weeks ago and finally got a chance to work on it after a busy month. 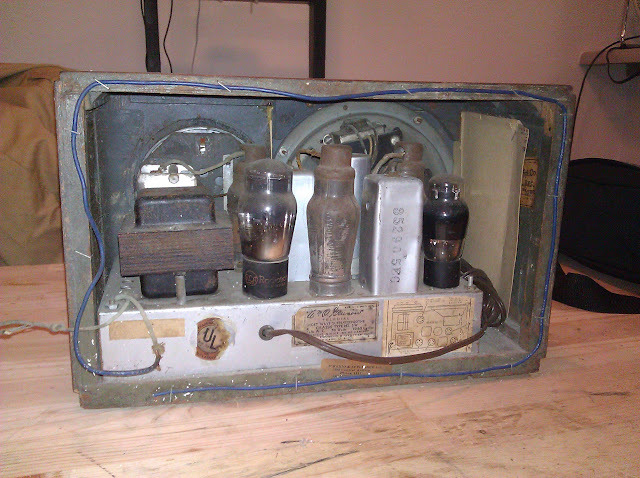 It’s a nice little five-tube radio that shares a lot in common with the Grunow 589s I’ve serviced in the past. 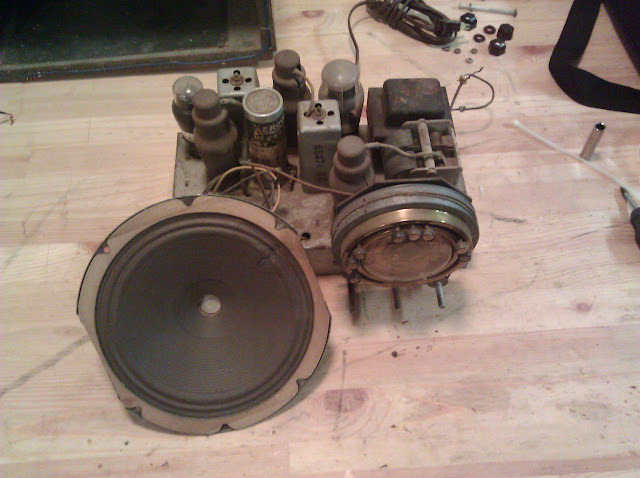 It has a very nice original finish, original knobs, pointer and dial cover in good condition although covered in bits of packing material. 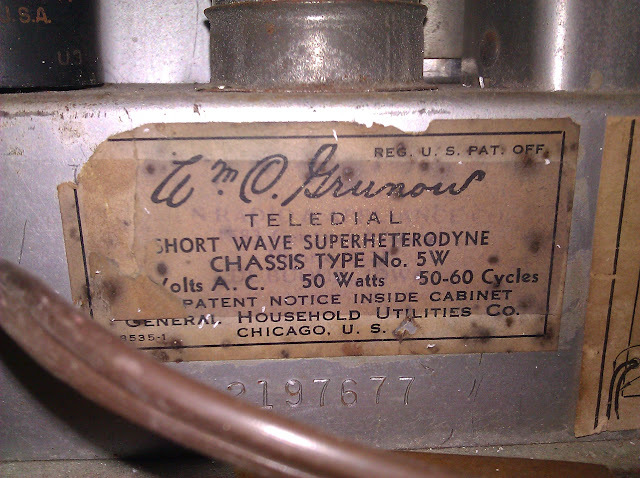 The Grunow 588 uses Chassis 5-W, which is also shared by Grunow 583, 585, and 586 radios. The tubes are 6A7 6D6 75 41 80. Nostalgia Air has the schematic for free from Rider’s 9-2. 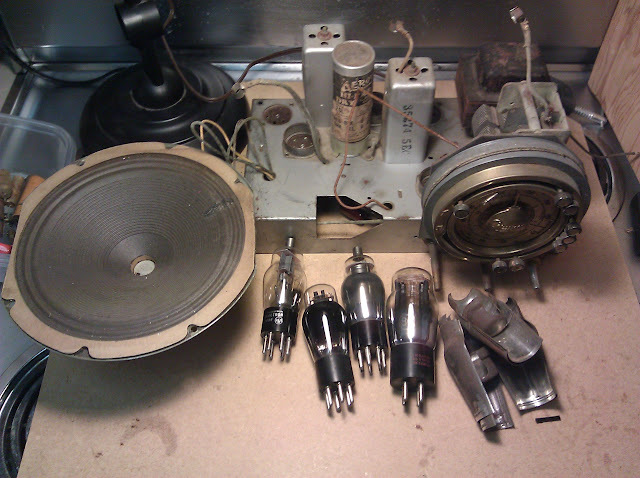 The radio has all the tubes and shields intact. 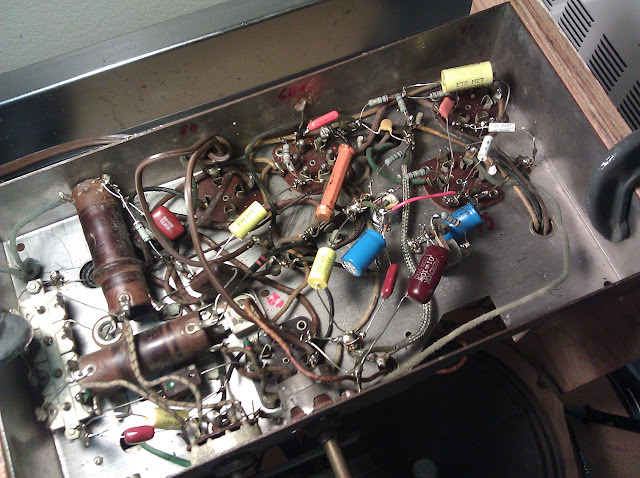 I tested the tubes and found 4/5 of them to be good, and the #75 tube had a good triode section but one marginal and one weak diode. I grabbed a NOS #75 from my stock but am keeping the used one as it probably has enough life left to be a bench sub. The chassis is a little dirty but has been stored well for the most part, not much rust and no evidence of critters. It’s been repaired a few times in the past. 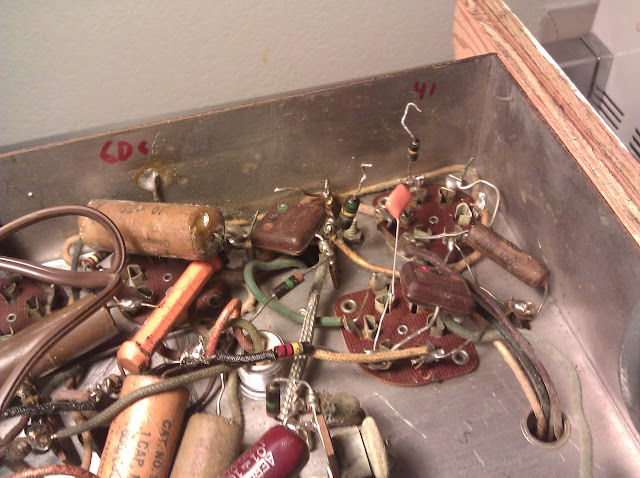 There are some ’40s, ’50s, ’60s and a ’90s capacitor present and a few different style resistors. I tested the coils and found everything to be good, fortunately, so it was right onto replacing caps and checking resistors. Most of the resistors needed replaced as did all the caps. 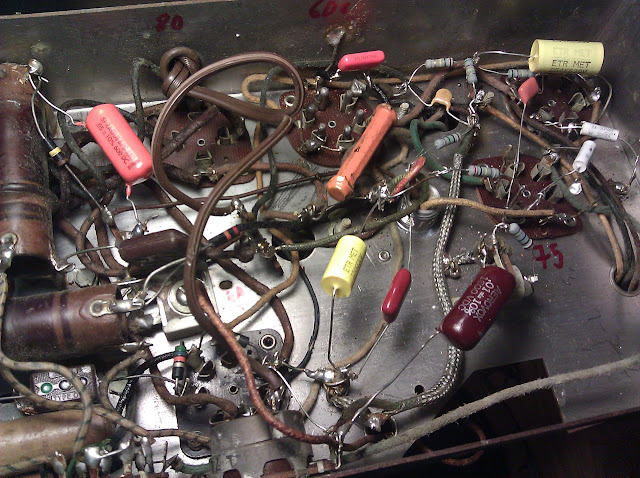 I replaced all the paper and wax capacitors, and the 8×8 electrolytic with two 10uF discrete caps. I also eliminated the bias cell and associated 1M resistor and replaced them both with a single 10M resistor to provide bias. Bias cells were only needed for a couple of years, it wasn’t long before engineers figured out how to eliminate them. Now, time for alignment! For IF, I used the signal generator at 465KHz; for the oscillator adjustments I used known frequency stations at either end of the dial as it’s a bit faster that way. It was fairly out of alignment – I’d say I probably doubled the gain through the IF, and the RF was way off: 880 was coming in about 930! I was using a shorter antenna so didn’t pick much up on shortwave, but that’s to be expected. Now, to put it all back in the cabinet! This one was fun. These Grunow radios are easy to work on, have straightforward but well built circuit designs, and come in interesting styles. 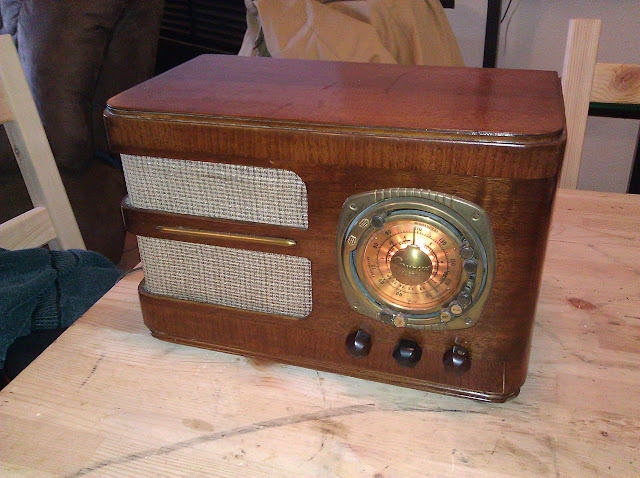 This Teledial table radio is unique for the era and it looks great on my shelf. Feel free to write in or leave comments with questions! 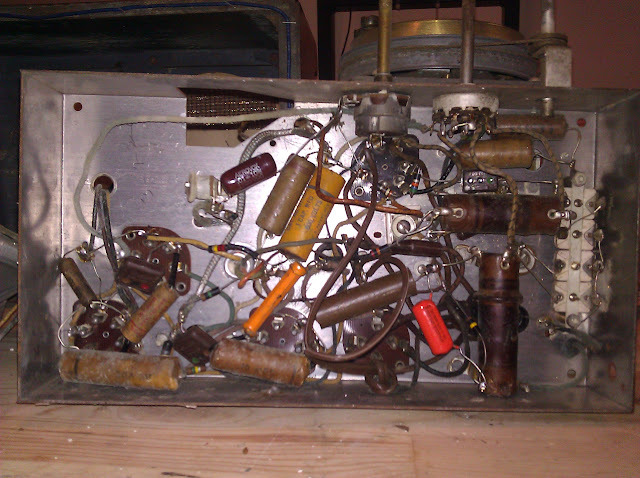 This entry was posted in Projects, Radios and Tubes, Vintage and tagged antique radio, antique radio repair, fixed old radio, grunow, Grunow 583, Grunow 585, grunow 586, Grunow 588, grunow chassis 5-W, Grunow Chassis 5W, old radio, project, questions, repair, restoration, tube radio, tube radio repair, vacuum tube. Bookmark the permalink. 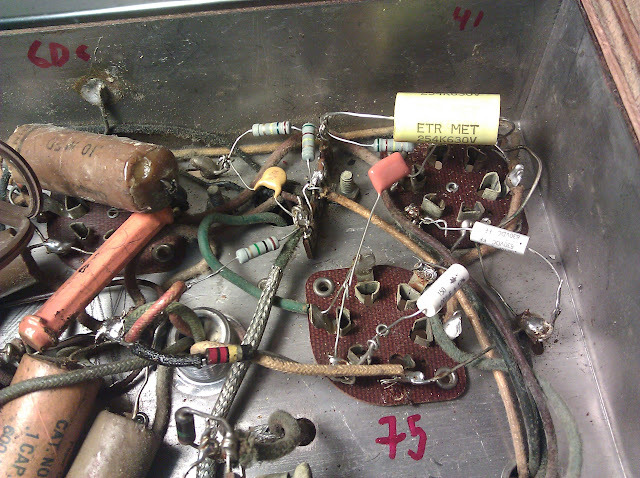 I found using a 2 meg resistor works just fine. Nice job, sir! 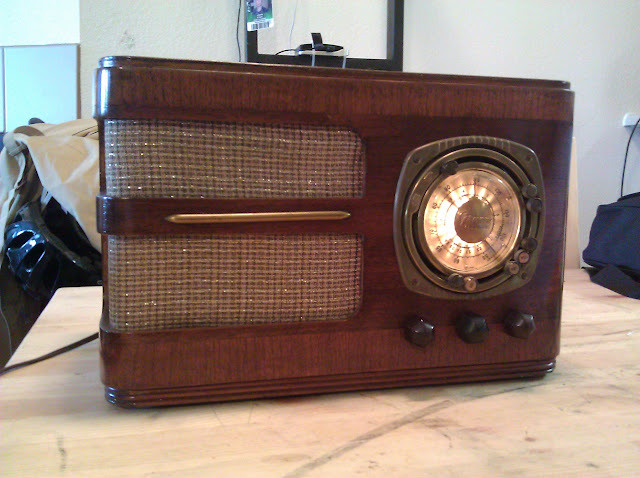 I have one also, a legacy radio that I must get working for sentimental reasons. 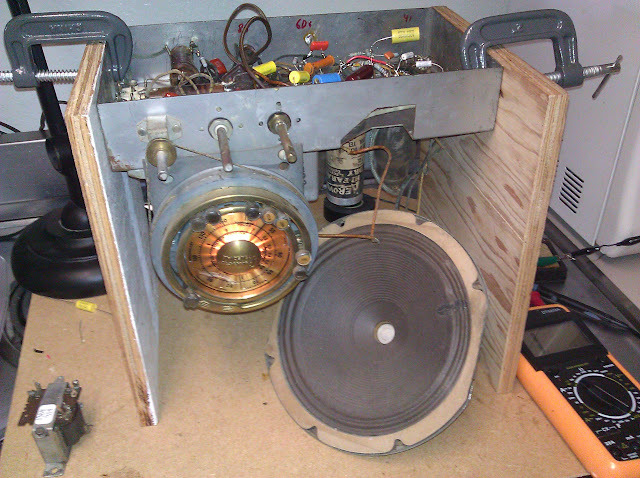 Case is a mess, but chassie very similar condition to yours. Would love to communicate with you. Thanks for the information. I also need a replacement dial for mine. I just bought a 588 and haven’t seen it yet, but I have a question about something you wrote “I also eliminated the bias cell and associated 1M resistor and replaced them both with a single 10M resistor to provide bias. Bias cells were only needed for a couple of years, it wasn’t long before engineers figured out how to eliminate them”. Cou;ld you explain? I never heard of it. 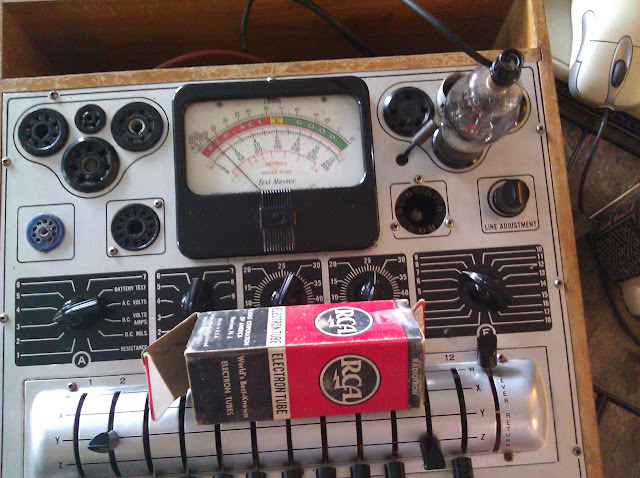 I have one of these and need a dial pointer. Nice job! I have a few of these laying around to work on. I need to find the time and eliminate the bias cells too.